Child's lymphatic system. 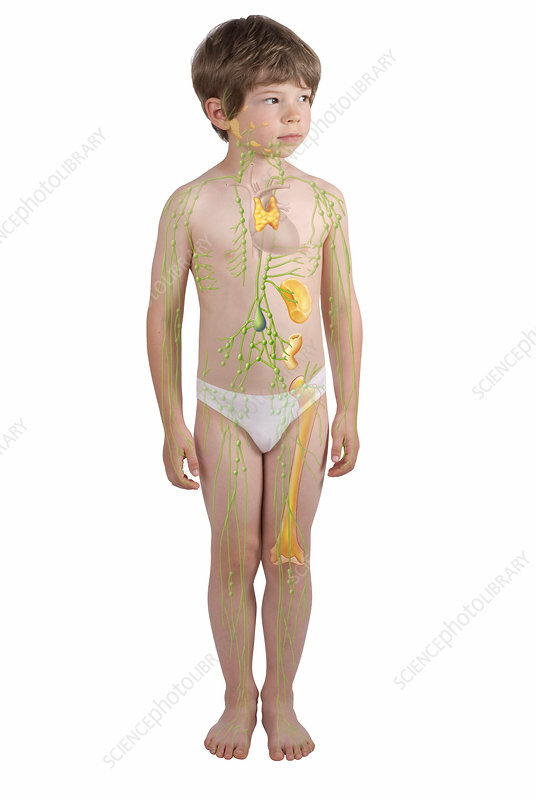 Artwork of a front view of a human child's lymphatic system (green). Also seen are associated organs and structures (yellow) including the thymus (near heart), the tonsils, adenoids and other head and neck glands (upper centre), the spleen (centre), Peyer's patches in the intestines (below spleen), and the thigh bone (femur) as an example of bone marrow. Lymph nodes or glands (rounded) are connected by lymph vessels that drain fluid (lymph) from body tissues. The lymphatic system aids the absorption of fats from the intestine, and plays a vital role in the body's immune system.